Starting solids? It's fun, but at times tricky milestone to figure out - you're constantly questioning whether food is too hot, too cold, or just right. 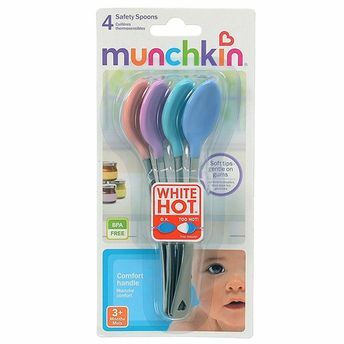 Munchkin's innovative White Hot Safety Spoons can help make those first feedings easier to swallow for both of you. Simply dip the tips of the spoons in heated pureed baby foods to check if it's too warm. If the tip turns white, the food is too hot for baby to eat. Wait for it to cool, dip again, and if the tip is no longer white - voila! You can feed your little one without worrying about a thing.